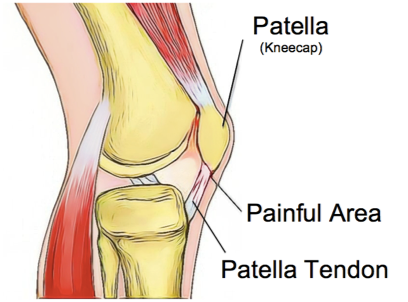 Patella tendinopathy, also known as jumper’s knee, is an overuse injury which is characterised by pain at the base of the patella (kneecap) with activities such as squatting, sitting or going up and down stairs. The condition is known as jumpers’ knee because it commonly affects athletes involved in sports that require jumping and repetitive loading of the patella tendon, such as basketball, volleyball, football and tennis. Landing and jumping activities put a great amount of stress on the patella tendon. This small tendon is responsible for transmitting the full force of the large quadriceps muscles to the lower leg and during activities such as jumping and landing, this force can actually be many times more than your body weight. The hallmark sign of patella tendinopathy is sharp, localised pain in the patella tendon just below the base of the patella. The pain is usually aggravated by activities that increase load through the quadriceps muscles such as squatting and jumping. Pain associated with patellar tendinopathy usually occurs gradually, often when a person has been very active for a long period of time or if they have recently increased their training schedule. The pain will often start as a small niggle, gradually becoming more noticeable and there may also be a feeling of stiffness with movements of the knee or first thing in the morning. Patella tendinopathy is not an acute traumatic condition rather, it usually develops gradually over time due to prolonged overloading of the tendon. Like other tissues in the body, tendons are dynamic and can adapt to be able to withstand more force with training. However, if a tendon is unable to adapt to increased load quickly enough, it can leading to pain and dysfunction, known as tendinopathy. The risk of developing this condition can be increased by external factors, such as the type of sports chosen, training volume and the hardness of the training surface. How can Enhance Physiotherapy help? As with all conditions, the first step to effective treatment is an accurate diagnosis. Enhance Physiotherapy’s Physio’s are experts in tendon pain and will be able to correctly identify this condition and any factors that have led to its development. Treatment for any tendinopathy will involve a degree of decreasing load and reevaluation of your training schedule. Treatment of the tendon itself has been shown to be most effective with a targeted exercise program involving isometric and eccentric muscle contractions. These types of movements have been shown to help stimulate healthy tendon tissue to increase strength and support the damaged tissue, ultimately reducing pain and improving function. Tendinopathies can be notoriously difficult to resolve without patience and commitment to a rehabilitation program guided by a physiotherapist. 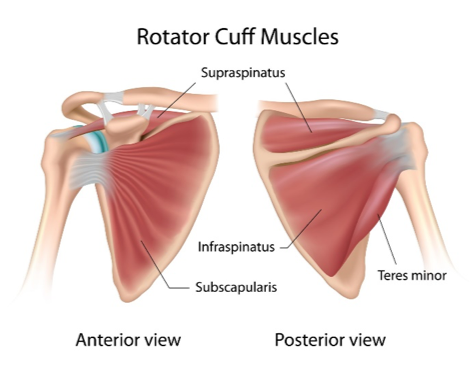 The rotator cuff is a group of four muscles (supraspinatus, infraspinatus, teres minor and subscapularis) that attach from the shoulder blade to the top of the arm and collectively act to improve the stability of the shoulder (Vollans & Ali, 2016). Rotator cuff injuries are a common compliant with most people over the age of 40 showing signs on imaging (Girish et al., 2011). A rotator cuff injury is any change within the muscle or tendon of any of the cuff muscles that results in varying degrees of pain and weakness(Vollans & Ali, 2016). It is typically aggravated by activates that include reaching, elevating the arm and even lifting. Intrinsic and extrinsic factors are said to combine and contribute to rotator cuff injuries however it is often caused through repetitive use of the shoulder or in response to a spike in activity (Pandey & Jaap Willems, 2015). Occasionally, rotator cuff injuries can be caused by acute trauma such as a trip or fall. 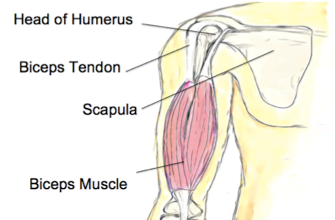 People with rotator cuff injuries often report pain on the side of the shoulder and even the arm. Physiotherapy is generally considered the first line treatment for the management of rotator cuff injuries with a structured and tailored exercise program often being the best approach (Lewis, 2016). Manual therapy, load management strategies, postural re-training, motor control exercises and postural awareness may also help to reduce pain and improve function (Lewis, McCreesh, Roy, & Ginn, 2015). The team at Enhance Physiotherapy are will equipped to treat and manage rotator cuff injuries with their up to date evidence-based knowledge, advanced clinical skills and elite strength and conditioning facilities. The biceps brachii muscle, commonly known as the biceps, sits between the shoulder and elbow. It has two parts: the long head and short head. These come together to form the main muscle bulk, which is the “Popeye” part of your upper arm. The biceps brachii muscle runs from the top and front of the shoulder all the way down to the upper forearm. The biceps tendon is the part that attaches the muscle to the bone, both at the shoulder and the elbow. The biceps muscle functions to bend the elbow and turn the hand to face palm-up. The term “tendinopathy” is used to describe injury and pain of a tendon. This is most commonly due to overuse. Biceps tendinitis tends to affect the long head of the biceps more commonly. Both the tendon itself and the tendon sheath can also be the source of pain. Enhance Physiotherapy’s staff are experts in tendon pain and rehabilitation and are up to date with the latest evidence based treatment techniques for tendon pain! Your physiotherapist will assess and diagnose this condition, which will in turn allow for a comprehensive management plan to be put in place. If you have developed secondary complications with changes to your normal movement patterns, your physiotherapist can assist you in addressing these and training your body to avoid causing further damage. If further imaging or onward referral is needed, your physiotherapist can help in guiding you through this process.